Throughout the 40 years of the ISAF Youth Worlds previous Laser Boys winners have become multiple Olympic Gold medallists and America’s Cup winners. Dean Barker (NZL) won Laser gold at the 1990 ISAF Youth Worlds in Muiden, the Netherlands. Twenty years later he won the America’s Cup with Team New Zealand skippered by 1980 ISAF Youth Worlds Laser champion Russell Coutts (NZL). 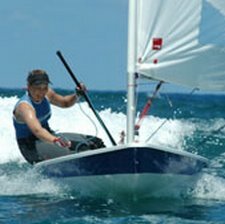 Sands finished 28th at the 2010 ISAF Youth Worlds and has been working hard in preparation for this years version, “Every time I go training I try to get the best out of each and every practice. I’m on the water 4-5 days per week and working out at least three days per work.